As you already know, the idea of Agile ECM (Enterprise Content Management) has emerged as a response to the challenges of our time. Agile ECM should have specific characteristics like flexibility to adapt to constantly changing business conditions, new management styles and methods support, maintaining control, and regulating execution of business processes and their performance. The previous article touches upon these characteristics in detail. 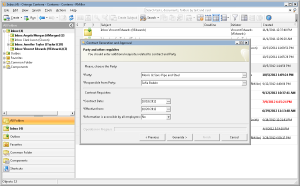 You can implement Orienge Conterra beginning with the core modules and extend its functionality if necessary. Such approach dramatically reduces implementation time and costs. 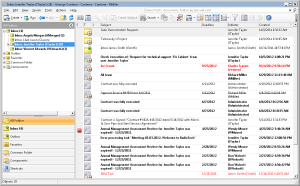 Conterra interface refers to Microsoft Windows and Microsoft Outlook user interface. That is why it is intuitive for users who already have experience in working with files and e-mails. Watch the video here to see Conterra interface. Intuitive user interface and clear system logic minimize the training time. Having learned the base system functions, users do not experience any difficulties in working with the system. You can find answers to all your questions in the help that is delivered with the system or you can access it online. Orienge Conterra includes an array of action wizards that let you perform complex actions step by step, for example, create a vacation request letter, sign and send it for approval. Wizards simplify complex actions and help you reduce time spent on routine tasks. Action wizards simplify complex tasks. Due to its module structure, Conterra can be implemented by modules. It means that you begin with core modules and extend the system functionality if necessary. Besides, a new module will be implemented much faster as you already have the infrastructure prepared which in turn helps you reduce implementation time and costs. Finally, the most important Conterra characteristic is a range of ready-to-use business solutions. Business solutions are targeted at solving key business challenges of your organization regardless of its size and line of business. Conterra-based business solution is a ready-to-deploy product combining technical solutions and consulting services designed to effectively overcome business challenges such as contract management, accounts payable and invoice management, records management. Every organization meets these challenges regardless of its size and line of business. One of the most important characteristics of business solutions is measurable business impact. You can define a set of KPIs that allow you to measure benefits the implementation brings. You can also reduce business risks through effective implementation of the comprehensive business solution. Besides the technical part, Conterra-based business solution includes training materials, implementation technology, consulting services as well as analysis of client business processes. Conterra-based business solutions embody Orienge’s technical know-hows as well as those of the business partners. Orienge constantly analyzes its experience and utilizes the best practices. That is why a range of business solutions is getting wider. Having high interoperability, Conterra business solutions use common infrastructure that helps you reduce time and costs for implementation and total cost of ownership. IS-Builder allows you to easily create applications aimed to meet your business challenges. Besides, it helps you integrate Conterra with other information systems. Agile ECM must also provide opportunity for quick and easy development of new applications. Besides, the typical applications should be adaptable to your organization business processes. 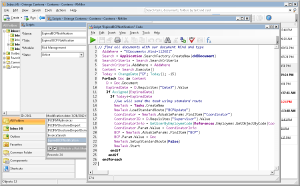 Conterra is based on the IS-Builder that is a core element of its platform and object-oriented development tool. Is-Builder lets Conterra be adaptable to specific business processes, enhance system functionality and integrate it with other information systems. IS-Builder is an object-oriented development tool. As an object-oriented tool, IS-Builder provides quick and easy development of applications to meet your business challenges. High-performance graphic tools used to develop standard routes, forms, and action wizards make it easier to develop applications in Conterra. Thus, the object-oriented development tool provides support for high system scaling and let you develop scalable solutions for automating business processes of every organization regardless of its size and line of business. Easy language and tool usability allow your developers to configure the system with minimum effort. Conterra standard routes are a powerful tool to streamline business processes of any complexity. User friendly graphic editor let you adapt your business processes to the constantly changing business environment. Support of flexible business processes is one of the most important characteristics of Agile ECM. It means that the system must be able to adapt your business processes to constantly changing business environment. A modern competitive organization needs a balance between flexible business processes and regulation-based ones. A plenty of horizontal links between the staff is not a synonym for anarchy. Flexibility, however, does not mean lack of regulatory and loss of control. Agile ECM means a flexible system that changes with the situation and streamlines diverse scheduled and ad hoc business processes with the same efficiency. 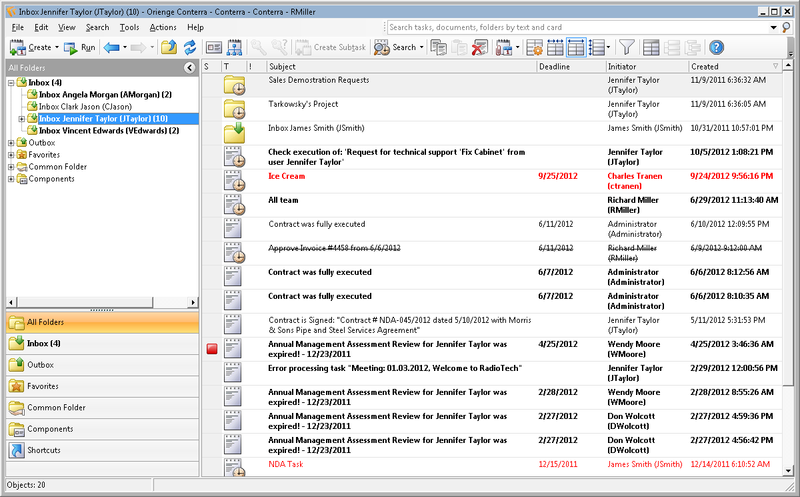 For this purpose, Conterra has a specific task-and-job combination developed that is a base for Conterra Workflow. Initiator sends a task to performer who receives a job to be performed. Task route defined by the initiator determines the order the jobs should be performed. You can design the task route manually or by using standard routes. This combination lets you easily organize scheduled and ad hoc collaboration such as contract approval between all team players. In each particular case, users determine the most suitable type of collaboration. A list of incoming jobs: new unread jobs and notifications are marked bold, overdue jobs are marked red. 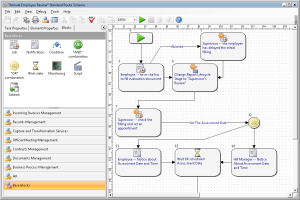 Conterra standard routes are a powerful tool for business process automation. The task route usually consists of several blocks, for example, “If”, “Stand by”, “Monitoring”. The blocks help you cope with complex business processes containing a lot of conditions and jobs to be performed simultaneously. Representing business-oriented workflow, Conterra standard routes include all tools required to configure business processes of any complexity, and let you configure the task route without system administrator or developer. Standard routes are configured via standard route scheme editor which is an intuitive, flexible and powerful developer tool. User friendly graphic editor and standard route debugger let you create, change, check and edit the route. 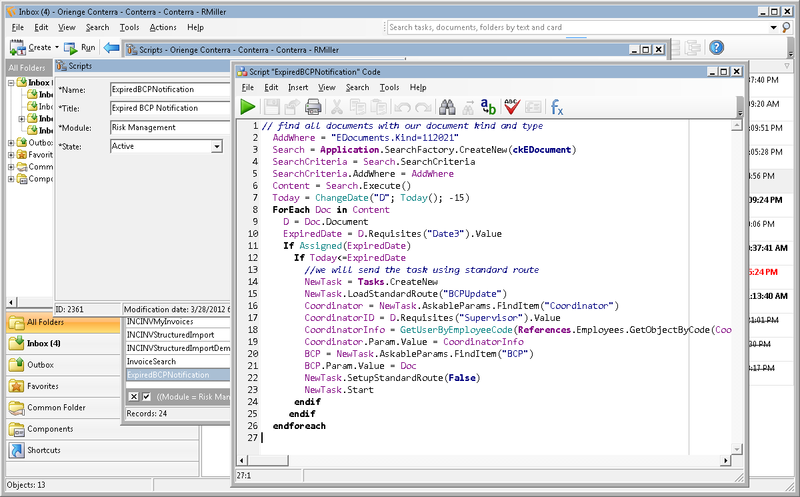 Intuitive standard route scheme editor. Conterra provides you with a comprehensive set of tools that help you gather statistics for business process performance, aggregate and analyze them. The results help you to determine whether any changes are required and adapt your business processes to the changing business environment optimizing your business process management. Thus, Conterra workflow, support of scheduled and ad hoc collaboration, professional tools for creating and changing standard routes allow you to streamline flexible business processes and adapt them to the changing business environment. Orienge Conterra provides an opportunity of including content into business processes that reduces time spent on searching for required information and increases labor efficiency. Including content into business processes is another characteristic of Agile ECM. It is important that all participants of a business process can access the required documents, information, and data wasting no time in searching. 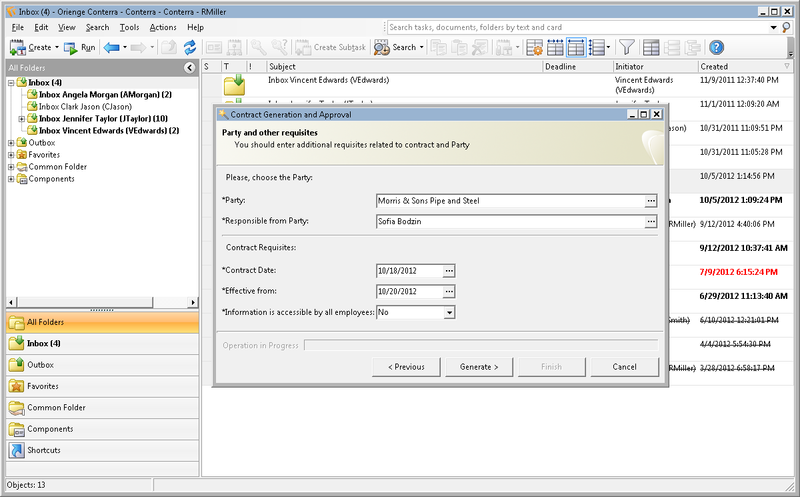 When you send a task in Conterra, you can attach any items to it such as documents, reference records, contacts that are stored in the system. Other participants can see the attached documents and can start working with them rather than wasting time on searching. 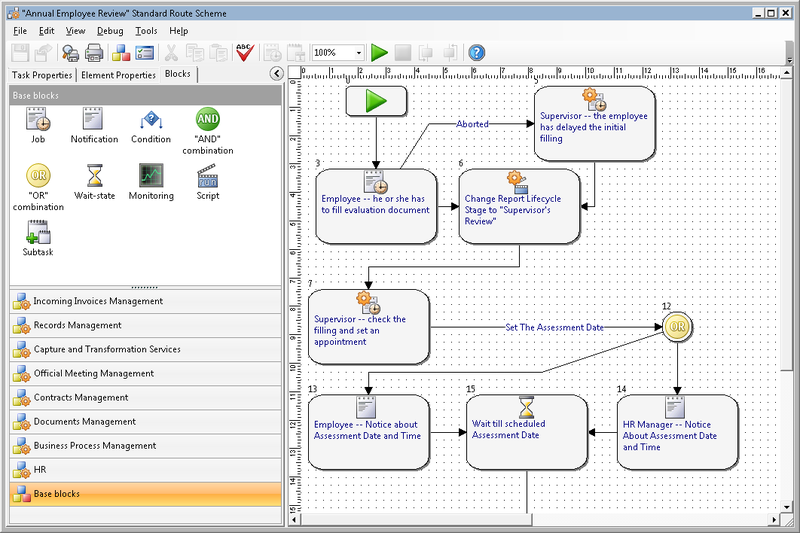 In addition, the task tree itself is an important source of information. Content included into the task guaranties that business process participants get access to the required information which increases the labor efficiency, and improves your organization visibility. Agile ECM is a demand of our time. The changing business environment, pressure of regulatory authorities as well as distribution of a new social-oriented management model force organizations to search for new ways to increase their labor efficiency. There is no doubt that organizations, their management methods, and ways of handling information should change and become more agile in order to be competitive. An ECM system usually takes the central place in every organization. Whether it can reorganize its business processes and stay competitive depends on its ideology and characteristics. In this article we examined the most important characteristics of Agile ECM. We highlighted diverse system characteristics for each demand: from system ideology and architecture to interface elements enhancing system usability. We also expanded on Conterra’s peculiarities that help you easily implement the system, and develop your own applications. We focused on Conterra’s orientation to business goal achievement, flexible business process support and including content into business processes. All this demonstrates that Orienge Conterra possess agile characteristics and can be considered a truly Agile ECM system. Use your chance to put Conterra’s agility to the test and get a working prototype of a Conterra-based solution designed individually for your very specific business requirements. Feel free to challenge us!